10 Second Paper Flight (LD27) is Online! Hey everyone! Great news, my entry for Ludum Dare 27 is online! 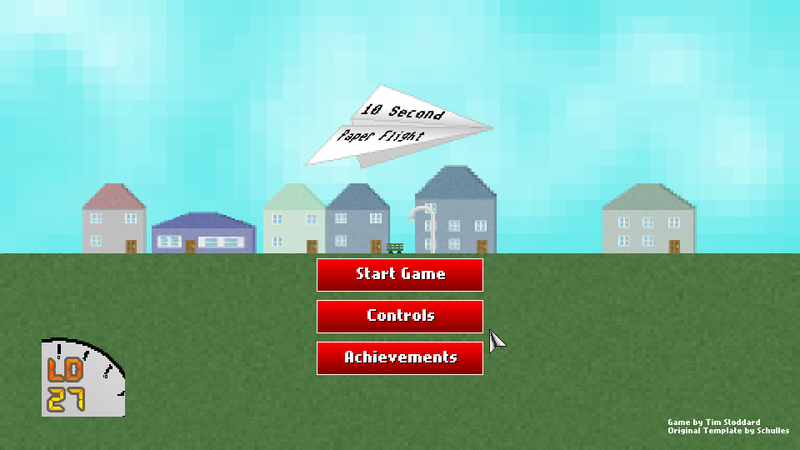 10 Second Paper Flight is a toss game, your aim is to make a paper aeroplane fly for 10 seconds, however it isn’t easy with the wind being powerful, and the things that parks get in the way! I built the game in Actionscript 3 using Adam Atomic’s Flixel Framework, with artwork in Photoshop, Music using Bu-Autotracker and SoundEffects using Bfxr. Considering it’s my first original game programmed in Flixel (no going through tutorials or dabbling about like I have done in Flixel for the last month), it’s impressive I was able to pull this off in 48 hours, with artwork AND sound done by me as well. Check out the Ludum Dare page here. Or play the game directly on Newgrounds! EDIT: You can now check out a timelapse of the making of 10 Second Paper Flight below! Make sure to vote and rate my game, as well as the many other brilliant entries that are online! Now if you’ll excuse me, I’ve got to vote on several game jam submissions! I figured with my second year has now been over for far too long, it’s time to show you some three month old University work! Also, I should be posting another update to Secret of Escape in about a week, so watch this space or IndieDB!